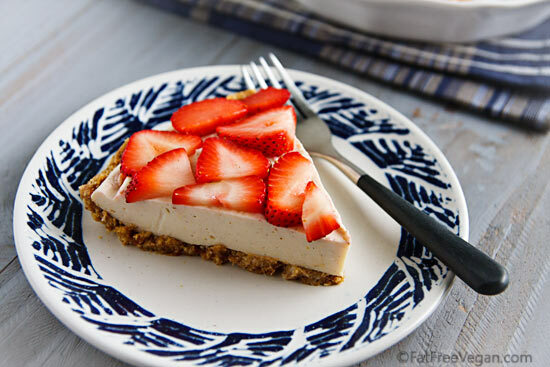 Sweetened with dates and stevia, this low-fat vegan strawberry pie combines an oat crust with a creamy tofu-cashew filling topped with fresh strawberries. My mother’s strawberry pie is the one dish I remember from my childhood with so much love that I’ve never tried to veganize it for fear of messing it up. 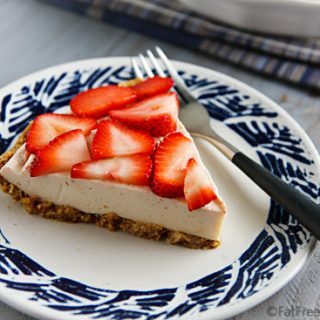 The recipe is simple–spread a layer of sweetened cream cheese in a pie crust and pour over it a layer of strawberries in a cornstarch glaze–and through the magic of Tofutti cream cheese, I know it could be easily made vegan. Still I resisted attempting it, in part because I don’t like the taste of raw Tofutti and in another part because I don’t like its main ingredients, soybean, palm, and olive oils. So it comes as a surprise to me that for the last two weeks I’ve become obsessed with not only making that cherished dessert but also making it without using vegan cream cheese, oil, or even sugar. You could say that I got over my fear of messing up my favorite childhood dessert by totally messing it up, recreating it from the pie crust up. The end result is similar to my mother’s pie but different enough to be a new creation, lighter and healthier but still a delicious summertime treat. I tested this pie three times before arriving at the “final” version (as final as anything can be in cooking). Like Goldilocks’ experience with the Three Bears’ beds, the first pie was too soft, the second was two hard, but the third was just right. Unfortunately, I don’t have photos of the “just right” pie–the single slice you see below is the “too hard” version; you’ll just have to trust me that the final version is firm enough to hold together but still manages to have a airiness about it. Finally, I know someone is going to ask about leaving out the cashews, and I apologize to those of you who are following a nut-free diet and can’t eat them. I used them because plain silken tofu has a chalky flavor by itself; lemon and vanilla can only go so far to mask it, so I used cashews to add depth of flavor and creaminess. The pie would be much lower in fat without them, but I haven’t made it that way and can’t recommend that you substitute anything for them. At least the fat comes from natural, whole ingredients, and 6.2 fat grams per slice is a pretty good deal for an occasional indulgence. If you’d like to lighten it up even further, try making it without the crust. Before You Begin: Place the cashews in a small bowl and add water to cover them by about 1 inch. Set aside to soak for at least 2 hours or in the refrigerator overnight. Crust: Place the 8 chopped dates into a food processor fitted with a metal blade. Add the oats and process until crumbly. With the machine running, add 2 tablespoons of apple juice. Continue to process until mixture begins to adhere together. If necessary, add more juice a teaspoon at a time, but be careful not to add too much. You want it to be sticky but not wet. Press into the bottom of an 8-inch pie pan and up the sides about 1 inch. Set aside. Filling: Drain the cashews and place them in the blender (a Vitamix or other high-speed blender works best, but others should be able to do a good job). Add the tofu, 2 dates, lemon juice, chia seeds, and lemon rind. Split the vanilla bean lengthwise and use a spoon to scrape out the seeds inside; add them to the blender. Blend on high speed until completely smooth, stopping to scrape down the sides to make sure all ingredients are incorporated. Taste the filling mixture and add sweetener to taste. (I increased the lemon flavor by using NuNaturals Lemon Stevia.) Leave the mixture in the blender as you continue with the next step. The next steps require you to work quickly. Heat the 1/2 cup of apple juice in a small sauce pan. As it’s heating, sprinkle it with the agar powder. Stir and heat until agar dissolves and juice begins to boil. Cook, stirring, for 1 minute after boiling. Quickly, add the agar mixture to the contents of the blender. Put the top on the blender and blend at high speed until well-blended. Scrape down the sides and blend again briefly. Pour into the prepared crust and smooth the top. Refrigerate until chilled and set. 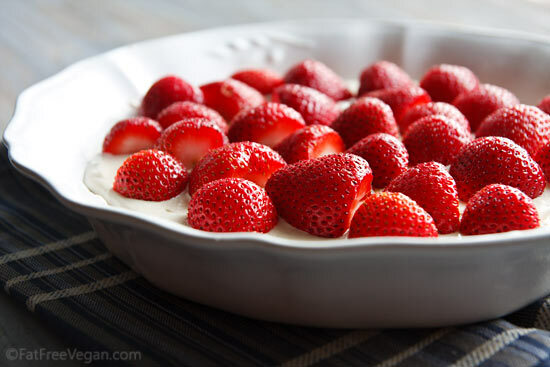 Top with sliced strawberries before serving. If being sugar-free isn’t important to you, consider using a strawberry glaze instead of plain strawberries. I’m allergic to strawberries so I’ll have to try this with a different fruit, but it looks AMAZING! Hi there! This looks so yummy…Would you happen to have any suggestions for someone who is allergic to cashews? Maybe sunflower seeds? But I’ve never tried it. Mmm…yummy, I could try that. First time posting but have appreciated all your recipes and have forwarded your site to many. Will definately try this recipe. One tip regarding the chalky tofu taste. I find that if you put the tofu in a jelly bag with a weight on top and squeeze out as much liquid as possible, it will remove a lot of the beany taste. You may have to add more water to make up for the lost liquid depending on the recipe. The difference is quite noticeable when making spreads or dips where the flavor is more delicate. Susan–this looks totally awesome. For sure the next dessert recipe I’m going to make! holy cow! YUMMM! THis looks absolutely incredible! love the fresh strawberries! Oh how I wish that were true, but it doesn’t work that way for me! I definitely gain weight if I add nuts to my diet without restriction. Here’s an analysis by Jeff Nelson that says those studies on nuts required total calories to be adjusted so that the participants didn’t gain weight: http://www.vegsource.com/news/2012/08/nuts-weight-gain-its-worse-than-we-thought.html . In some of them, the people simply replaced high fat snacks with nuts and didn’t gain weight. To me, that’s definitely not the same as adding nuts to a low-fat diet and expecting not to gain weight. Regardless, this pie looks delish and is making me rethink my chocolate “mouse” pie as well. Thanks for the ideas and the eye candy (pie) Susan. Thank you! Thank you! Thank you! I have been mourning the strawberry pie you described. My entire family will also thank you when they eat this! Ok- I am cool with the cashews, but do not have agar – any subs? I have Axanthum & Guar gum? This sounds so good! You can get agar agar on amazon though! 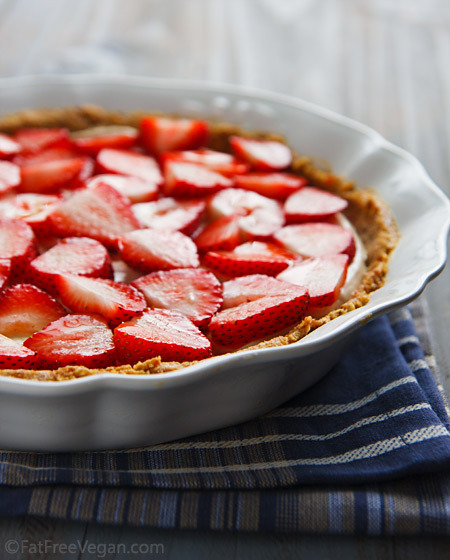 Susan, this looks great, but I must admit I’ve never had a strawberry pie with anything in it except strawberries with glaze. There was never anything under them except crust! I will give this a go, tho, thanks! Oh, that looks so delicious. My BFF is coming over this weekend for her birthday dinner and I think this will make a delicious dessert! This looks fabulous! I”ll definitely try it! I’m happy to have something healthier than Tofutti to use! Does this taste like a decadent dessert, or can you ‘tell’ that it is a low-fat, oil-free version? I don’t have dessert that often so when I do, I like to indulge. But I may give this a whirl sometime if the taste is good! I love this! It looks amazing. Anything made with cashews, I’m all over. Thank you for the recipe. Hello – is there a substitute for the agar? FFV will always and forever be my favorite food blog, for so many reasons. Even if/when you do someday retire from it, it will continue to be an amazing resource. I was introduced to this healthy world of eating via FOK, when I reached your website however, I discovered the fun of it all, thanks. Hi Susan, this looks amazing! But I am allergic to soy. What do you think could be substituted for the silken tofu? I really can’t recommend anything. There are raw recipes for cheesecakes made from nuts. I suggest looking for one of those (though it will be much higher in fat). Ever since I started to embrace a vegan lifestyle, I have been collecting vegan dessert recipes. I’m glad you provided the recipe and I can’t wait to get started on my baking session. Is it fine if I use apples instead of strawberry? Sure, you can use any fruit you like! This looks totally delicious and I can’t wait to try it! I’ve given you a Liebster award, check out the details at http://cookingjamie.blogspot.ca/2012/08/3-years-and-award.html. I made this and found it sooooooo tasty. Followed the recipe for the crust. Added a few pecans to it to make it sturdier, but non the less it just got really soggy. Would you think this is normal? It still tasted amazing!!! I added a little cinnamon. But would def make it again!! Thanks Susan. You’re soooooo intelligent with these recipes and combinations!!! Appreciation! Love the Goldilocks reference. I am shopping soon and adding in the ingredients for this pie!!!! I glazed over this recipe when you first posted it because I saw the word tofutti. I will have to make this! I can’t eat many vegan desserts in coffee shops because so many use tofutti cream cheese. There is a thickening agent in the tofutti, the guar gum that can you very very sick. I am more sensitive to it than most people but still. They actually marketed guar gum as a diet drug for a few years until it started killing people. Thank you for the beautiful pie I can eat! Just bought all the ingredients for this and plan to get started on it tonight! A wonderful end-of-summer dessert! I have everything except the Chia Seeds. Is there anything else that I can sub for them? I’m pretty sure that you can just leave them out and it will be fine; the filling is firm enough without them. Please let me know what happens if you make it! Or you can use ground flaxseeds 🙂 I always use that instead of chia, because it is a lot cheaper here. For celiacs, oats can be an issue even if gluten free. I have a strong reaction to oats. What could I use instead. Here is a typical list for cross reactive problems. Of these I’m ok with coffee, rice, corn, and soy. Tapioca in very small amounts. Hi Susan, I don’t have a high-power blender, so I’m going to use a store-bought pie crust. Can I use jarred cashew butter in place of the raw cashews? If so, how much should I use? Chery, I would guess about 1/4 to 1/3 of a cup of nut butter. Good luck! Looks delicious! I am wondering whether I can make this ahead and how well does it keep in the fridge or freezer? Thanks. It should keep in the fridge for several days. Freezing might change the texture, though.